Isolation can lead to insanity in horror cinema, where the supernatural may either be real or a manifestation of madness. Director Emma Tammi’s The Wind — from a screenplay by Teresea Sutherland — plays with both of these fright-fare tropes and places them in the unusual setting of two 1800s prairie homes. The result is an enigmatic slow burner that I found captivating throughout. Starting off with a stillbirth and funerals in its opening minutes, The Wind announces immediately that it is a somber, moody piece, and it maintains that brooding tone through to the finish. Lizzy (Caitlin Gerard of Insidious: The Last Key) and her husband Isaac (Ashley Zukerman) have lived a long, difficult time farming their prairie property before newlywed neighbors Emma (Julia Goldani Telles of Slender Man) and Gideon (Dylan McTee of Midnighters) move in nearby. The story alternates between flashbacks and current events, as tragedy befalls each couple but life goes on regardless — until even that is no longer a given. 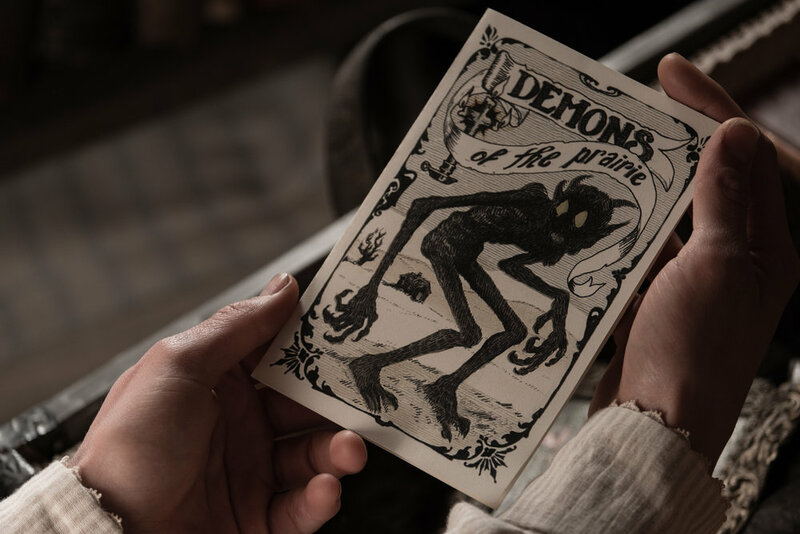 Lizzy and Emma take stock in a pamphlet called Demons of the Prairie, and while Isaac goes on errands that keep him away for days at a time, those infernal creatures and the havoc that they create increasingly haunt Lizzy. A visit from a reverend (Miles Anderson) seems to only complicate matters for her. The terrific sound design, along with a superb score by Ben Lovett, are huge reasons for why The Wind works so well. Silence is as important as the wind and other ambient noises in the world of the film, and adds to the tension that Tammi builds. The film looks gorgeous, too, thanks to the cinematography of Lyn Moncrief. Gerard is outstanding as the increasingly unraveling Lizzy, a woman who is either going insane in her solitary surroundings, or seeing the evils that she fears so much coming to call. The rest of the small cast is fine, as well, bringing their tragic characters to realistic life. Viewers who enjoy ambiguity with their scare fare should find plenty to love about The Wind. Its haunting qualities, unique setting, and fine performances make it one of my top five favorite horror films of the year so far. The Wind, from IFC Midnight, opens in theaters and on VOD on April 5.